Several years ago, when we first moved into our current home, I became quite obsessed with Diarmud Gavin and his creative approach to creating contemporary gardens. I’d loved watching him on Home Front with Lawrence Llewellyn-Bowen, where he offered a voice of reason and practicality against Llewellyn-Bowen’s often, outrageous designs. One aspect of Gavin’s approach I was particularly drawn to was the way in which he used different materials to build interesting and unusual structures within an overall scheme. It seemed really innovative and ground breaking at the time (no pun intended!). I found it so inspiring I even bought one of his books and tried to apply his techniques to the development of our own garden. Creating imaginative gardens, when you’re not a gardener can be done. It just takes a little research and understanding of what your needs and requirements are, and applying that to the space you have to work with. Take this garden for example. 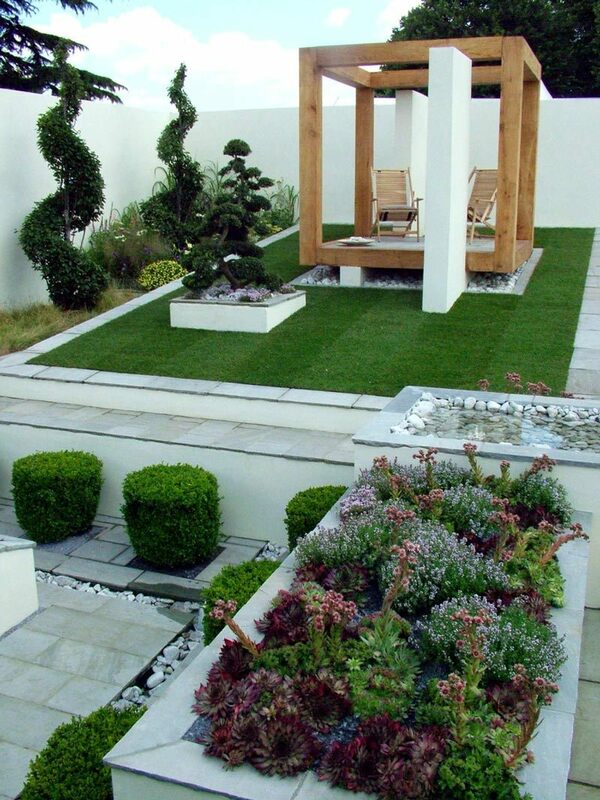 It’s not for everyone but they’ve used the space really well to create a modern garden full of interest and unusual features. The raised seating area created the focal point whilst the topiary softens the hard edges of both the wooden platform and the concrete beds. 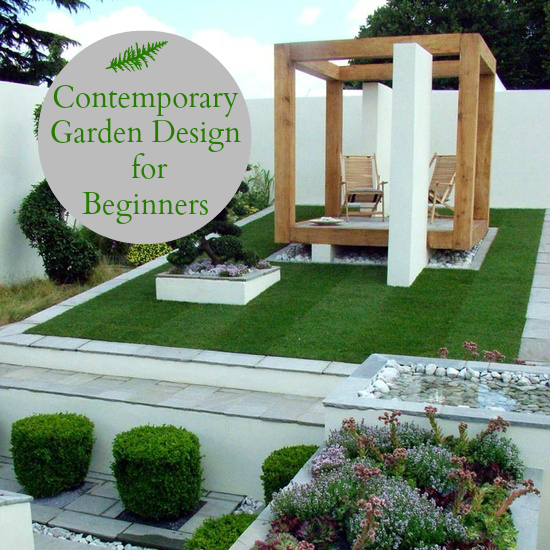 Planning a garden like this isn’t as difficult as you think and there are loads of great tools out there that can help you when you begin. To begin with look at this great gadget for calculating how much concrete you might need for specific jobs – what a great idea! What about a contemporary garden for a family? Can that work? Can you create spaces and areas suitable for everyone? Adults like to somewhere to sit, relax and eat, often with friends, whilst the children need space to run and play. Their space needs to be safe too and probably devoid of delicate plants and foliage. This garden, pictured above is a good example of how contemporary and modern landscaping can include aspects for the children too. This fabulous blue path adds some real interest to the expanse of play bark and creates a fun feature for the children too. The play area still looks aesthetically pleasing even though it contains plastic slides, where the blue scheme ties it all together. During my time of Diarmiud Gavin obsession I learned that you don’t have to be a serious gardener to be able to design your own contemporary garden. I found lots of great sites that provide excellent information on plants. A particular favourite was this one for Architectural plants where I nurtured my love of the Banana Tree or Musa Basjoo and discovered lots more hardy tropical plants to include in my own modern garden. Then on our trips to Cornwall I would often pick up one or two more evergreens and really started building my collection. Modern garden design can be for everyone. It should be for everyone. If you love designing the interior of your home but haven’t yet taken that love out into the garden, do give it a go this Summer. You’ll be really pleased you did! Nice article Jen. Being a garden designer myself I can appreciate the rewards you get from a well planned layout. interesting article, really inspired me, thank you.